It used to be at the beginning or end of the European season, cruise lines had to get their ships to or from the Caribbean, so they create the fastest itineraries possible, with a minimal number of ports, they’d price the sailings very low to attract people to spend money onboard, and get them across the ocean as fast as they could so they’d be back on an itinerary where they could start making money again. Not anymore. Times have changed, and repositioning cruises are sought after. Now Royal Caribbean is now even branding their trans-ocean repositioning cruises. CND subscribers also read about a busy weekend in Venice ... major growth in Marseille ... and What Else? * Will You Remember the Moments that Matter? Brace yourself. Carnival is about to let loose another advertising campaign that, judging by previous campaigns, will give you constant opportunities to see it on your favorite TV shows - and all over the internet. In this CND article we look at the new commercial, and examine what may be the fatal flaw(s). Seattle, Wash., Sept. 19, 2013 — Holland America Line has promoted Robert Hon to the position of senior director, financial systems and cash management. Hon will report to Larry Calkins, senior vice president, finance and information, technology and chief financial officer for Holland America Line. In this capacity, Hon will work to enhance identification, prioritization, design and execution of financial process improvement initiatives. He also will drive best-practice adoption and lead the company’s transition to procure-to-pay and bill-to-cash processes. Prior to his promotion, Hon was director of planning and administration in Holland America Line’s guest programs department. In this position, which he held for seven years, he led the reorganization of the group and account services department and directed the implementation and development of the line’s Care Team. Hon began his career at Holland America Line in 1990 in the finance department where he held many positions, including controller of budgets and controller of cruise accounting. Hon holds a Bachelor of Science in Business Administration from Eastern Oregon State College and a Master of Science in Finance from Seattle University. MIAMI (September 19, 2013) -- Carnival Corporation & plc (NYSE/LSE: CCL; NYSE: CUK) today announced Josh Leibowitz as the company's executive vice president of group strategy and corporate operations, effective October 1. Leibowitz, 42, comes to Carnival from the consulting firm McKinsey, where he served as its managing partner of the Miami office and the leader of the company's work in big data and channel management -- experience that will be important as Carnival strengthens its marketing and customer relationship capabilities. Leibowitz succeeds Richard Ames, senior vice president of corporate business services, who is retiring after 24 years of service. "Richard has been a tremendous asset to our company and we thank him for his significant legacy, undivided loyalty and dedicated service," said Howard Frank, chief operating officer and vice chairman of Carnival Corporation & plc. "Josh was the first person who came to mind for this role given his tremendous experience with McKinsey." Before joining McKinsey in 2001, Leibowitz was a managing director at Idealab, where he ran early stage e-commerce companies. He began his career as an entrepreneur founding retail, wholesale and e-commerce businesses. 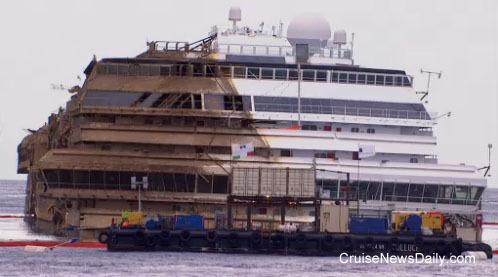 Did you really expect that there would be a major event like turning a sunken cruise ship right-side-up and there wouldn’t be a television special about it? There will be already on Friday night in the US and shortly thereafter in the rest of the world. The Discovery Channel has produced “Inside Raising the Concordia.” It steps back to the beginning of Titan Salvage's involvement and follows the planning and preliminary work to last Monday’s actual event. CND subscribers also read about another port in the Bahamas ... and the port in your phone. Norwegian Cruise Line added a new feature to their newest ship and its sister for those with a sweet tooth and unclogged arteries. The Ice Cream Bar has just debuted aboard Norwegian Breakaway, and Norwegian Getaway will debut with it in Miami this winter. MIAMI (September 17, 2013) -- Mike Julius has been promoted to senior managing director of U.S. trade sales for Carnival Cruise Lines, the world’s largest cruise operator. An accomplished member of the Carnival sales team for 24 years, Julius most recently served as managing director of U.S. trade sales. In his new role, he will oversee Carnival’s U.S. sales force and be responsible for trade support, including training and development, as well as business development growth. He will continue to report to Carnival’s Vice President of Worldwide Sales Joni Rein. Julius began his career with Carnival in 1989 as business development manager for the northern Midwest region. Various promotions followed thereafter, including director and vice president of sales for the central U.S. region, prior to taking on his most recent role as managing director of U.S. sales. Julius began his professional career in the travel industry, spending 11 years at AAA Iowa Travel & Transport as a leisure travel specialist. 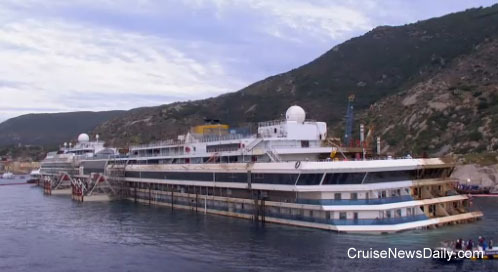 The parbuckling operation to right Costa Concordia ended at 4am local time on Giglio Island (10pm Eastern time in the US, September 16, 2013), and the operation was lit only by artificial lights at that hour. But that was only a little more than a couple hours before daylight. Throughout the operation, Costa Crociere and their engineering partners in the project, had been providing a live four-camera video feed of the amazing work as it was proceeding. 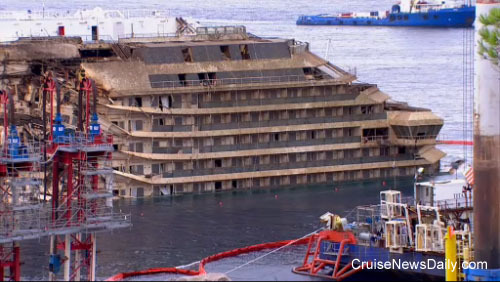 The feed continued for a couple hours after, into the daylight, giving the world their first look at Costa Concordia again sitting upright, although still with the lower decks submerged as its hull sits on a platform constructed to support it 30 meters under the surface of the sea. The video feed was to end before most of readers in the US would be awake, so we captured a few screen shots of the video which give a first look at the starboard side of the ship which has been under the water for the last 20 months. This was the time it was also giving engineers their first look at the damage to the side of the ship on which its weight had been resting for almost two years. These are not high resolution images for publication; they just taken from the video feed as it came up to give our readers a first look at the damage. 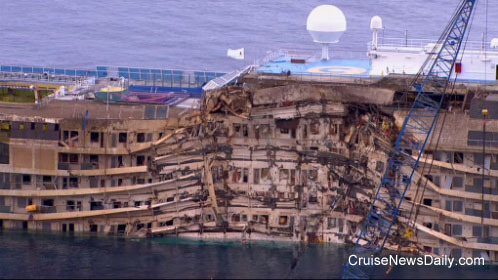 This wide shot shows the entire 900-foot ship, and much of the structure looks remarkably undamaged. As the engineers noted in one of the press conferences yesterday, as it was raised, the ship experienced little bending or torsion during the parbuckling. This image can serve to help you orient yourself as you look at some of the details below. Note that many of the top deck features (including most of the funnel) were removed while the ship was on its side. This image shows the forward part of the ship shot looking forward from just behind. Note the starboard bridge wing for orientation. If you remember the iconic images of the ship's bow and port bridge wing from when the ship was on its side, this image demonstrates how much of the ship is now underwater. Note the brown grime that covers most of the parts of the ship that were underwater. This picture was taken looking toward the bow and almost directly into the navigational bridge. As you can see there is now only one deck visible below the bridge. Note the diagonal line of grime and rust that is running through the center of the ship. This was the waterline when the ship was resting on its side only hours before. This is the stern of the ship, looking forward. Again it serves to demonstrate how little of the ship is now above the surface, and again, the grimy waterline, with this time the part that was underwater on the right of photo. Note that the top of most of the 7- and 11-story sponsons attached to the port side are below the water. There appear to be two areas most damaged on the starboard side this is the more forward one not too far behind the image we have above of the forward staterooms and bridge wing. It appears this area and balconies were crushed when the ship came to rest on it and the uneven terrain. Note the relatively clean top deck that was out of the water and undamaged satellite domes. This is the area most damaged that is more aft. 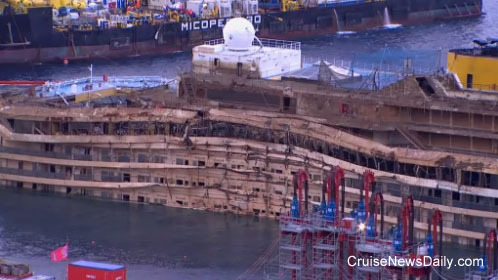 Again, the crushed balconies can be seen where the weight of the ship apparently came to rest on them. Photos courtesy of Costa Crociere, all rights reserved. 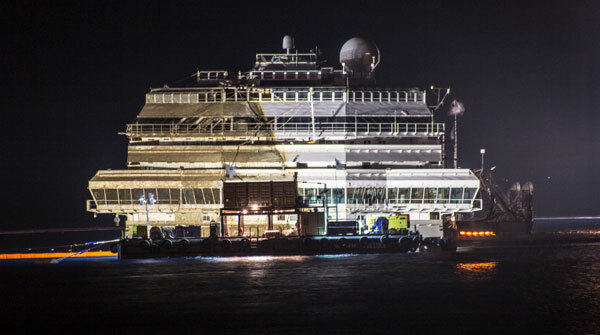 Tonight, Costa Concordia is once again upright. The parbuckling was completed later than estimated, but overall, project managers are telling us that despite some minor glitches, everything went exceptionally well, and things progressed according to plan. More from Monday's ongoing coverage of the operation. CND subscribers also read about they type of people searching your luggage ... Fenderbender in Bari ... STX yard to close ... and former Carnival favorite under arrest. After about a three-hour delay, the parbuckling operation began Monday morning. A storm overnight delayed the positioning of a barge on which the control room for the operation is located. Weather today, however, is considered near perfect. It will be several hours after the operation begins before any movement of the ship will become noticeable to the naked eye. During the operation, it is possible that the bodies of the two missing victims will be found. Engineers said the rotation was about 3 degrees. The ship has been resting at a 65-degree list. The ship has been lifted off the seabed, although it is not standing upright. Costa Concordia is now resting on the undersea platform constructed to hold it during this and the next phase of the operation. In the video from the site, the rusty waterline created by parts of the ship being under water for 20 months, is now clearly visible indicating definite movement. Engineers said in a press conference that they are approximately halfway through the operation, and it should take another four to six hours. Everything is proceeding very well, and there has been no spillage from the ship. At the press conference, engineers said that during the early phases of Monday's parbuckling, the ship was being pulled upright, but they had reached the point where the sponsons, the giant tanks affixed to the port side of the ship, could begin to be slowly filled with water, and the weight of the water would begin to do the work of rotating the ship. The rusty waterline, indicating the parts of the ships that have been under water, is clearly and steadily growing and is now several feet long. When looking at the top of the ship, it appears to be quite a few feet out of the water, perhaps several meters. Engineers onsite confirm the ship has reached 10 degrees rotation. It now appears both side of the top deck are now out of the water. It should be remembered that once the ship is righted and sitting on the platform, portions of the ship on the port side which have been dry since the rest of the ship sank, will be underwater, and only the top portion of the ship will be out of the water until the next phase of the phase of the operation which refloats it. The process is taking longer than estimated due to some difficulties with a few cables and chains being tangled. Engineers are not considering it a problem; it simply slowed the operation a bit. The parbuckling will now continuing into the night, and the ship will be lit as it usually is, and the engineer say that will be sufficient lighting for the parbuckling to continue without a problem. Project managers stressed that while there have been some minor problems, overall everything has gone amazingly well, and the project is essentially going according to plan. The rotation continues, and the now as a gauge of the progress, the starboard bridge wing is coming out of the water. The ship has now rotated 25 degrees, and it can now rotate on its own under the weight of the water in the sponsons, so they can quit pulling it. Onsite engineers now confirm the ship has rotated 35 degrees. 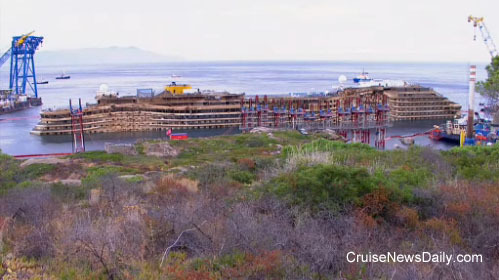 Costa Concordia is once again upright and resting on the platform 30 meters below sea level. The project managers say the parbuckling is complete. September 15, 2013 - The international team that will raise the wreck of Costa Concordia has confirmed a favorable forecast of weather and sea conditions for Monday (September 16, 2013), and confirmed the the parbuckling operations will begin at 6am (local time - midnight Eastern time in the US) on Monday. Operations are expected to wrap up on Monday by noon Eastern time in the US (6pm local time) by which time it is hoped the ship will be upright.